The sky was dark, overcast, and, even though it was the end of June, the wind howled as only it can on the North Dakota plains as we drove on the dirt road between the wheat fields trying to catch sight of a farm house to ask directions to the old Jewish cemetery. Twenty-two years have passed since our last visit. We now live thousands of miles away in the State of California. The year was 1889. It was a beautiful spring day in Chicago. Israel Mill and his younger son, Max, having recently arrived from Europe, after much debating, decided that their future lay in farming. Without any money, trade, or profession what could a man do even in this golden land of opportunity? Business was not for him. The love or land was in his soul. Land he could someday call his own. 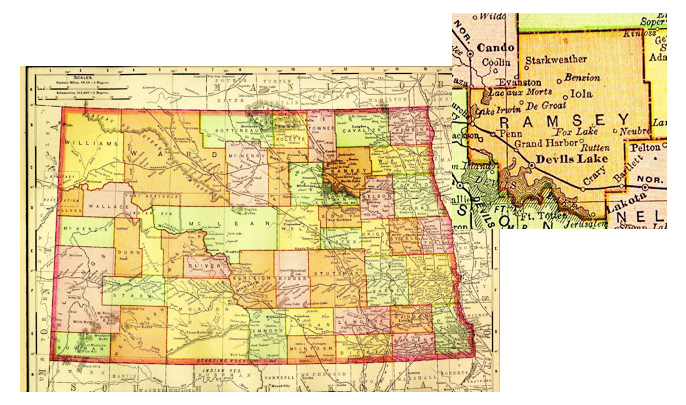 He had heard of a Jewish settlement, the Baron de Hirsch Colony, that was organized two years before in North Dakota. But where was North Dakota? To get there presented a real problem. After many weeks of inquiry, he obtained a little information and much advice from friends and relatives, who for the most part tried to discourage this undertaking. Hardships would be great they said. North Dakota was a wilderness hundreds of miles away. And even if the government was giving the land away, homesteads of 160 acres to each family, it would not be worth the risk they argued. But being a very determined· man, he decided to buy some equip­ment. With a loan from relatives, he bought a covered wagon, two horses, and food enough to last for several weeks. Together with his family he set out for 11the promised land”. The journey was hard and long. They traveled by day and night and they slept in the covered wagon. Through rain and mud and through thunderstorms and hail they traveled, searching for short cuts on roads that were only trails at times. Finally after two months of crossing miles and miles of bare prairie land, they reached their destination — their rainbow at the end of the trail in the golden land of opportunity. It had seemingly endless miles of open prairie covered with tall grass that grew waist high on land just waiting for strong arms and backs to bring civilization to this part of the country. With practically their bare hands they cultivated a plot of land and built a small house of sod. It had one large room, which was to house a family of four and, if need be, a sick calf or colt in the winter. The neighbors taught them to build the thick walls of sod, roofs of stalks of grain interwoven with ropes made or tree bark, and the floor of sand found near river banks and sloughs. Adjoining the outside of the north wall of the house was the chicken coop with rows of wooden strips for the chickens to roost on. The coop served as insulation from the bitter cold northern winds in the winter. The one room sod house served as a combination living room, bedroom, and kitchen. The outer walls and adjoining chicken coop were banked with mud and in the winter with manure to keep out the bitter cold wind. The house was cold in winter and hot in the summer. The furniture was made almost entirely of apple boxes. The table consisted of rough boards. The bed had a mattress of straw. Such was Israel’s Castle! He could now send for his wife and daughter and eldest son, Manacha, who were still in Europe. Manacha, who was now married, had two children of his own, Molly, a little girl of five, and Louis, three years old. They all arrived in New York bag and baggage and their first stopover was Chicago. Israel’s wife, Frieda, and daughter, Sarah, immediately embarked for North Dakota. Manacha and his family remained in Chicago. Manaoha would have liked to join his father right away. The love of land was also in his soul. But he had to make a living for his family. To ply his trade as a shoemaker would have required that he work on the Sabbath. This was against his principles. He thought perhaps a dairy farm close to the city would solve the problem. But how does one start without any money? First, one must earn enough for one cow. He was advised by relatives to be­come a peddler of merchandise. Since, however, he could not afford a horse, he peddled with a pack on his back from house to house, and later from farm to farm. At last he earned enough to rent a farm of a sort — a tumbled down house and an old barn, which would eventually shelter a cow and some chickens. He established his family there and continued to peddle every day of the week, except the Sabbath when he would rest. On the Sabbath with his family gathered around him, he would read a portion of Torah, translating each word from the Hebrew into Yiddish and, later, when he had learned enough of the language, into English. No matter how hard or how discouraging the week bad been, on the Sabbath he felt like a king. And so the years passed. His family grew in numbers. There were now two more sons, more mouths to feed. Every year Manacha added one more cow. He was now able to stop peddling and devote his full time to dairying. And now that he was able to provide the necessities of life for his family, his thoughts once again turned to the land. Just to own a piece of land, no matter how small, was his one dream. He had been in this country for more than 10 years now. Still, he was not able to join his father, the father whom he adored and admired. He could never spare the time from his work, it seems, nor could he afford the cost of the train trip to North Dakota. Those were bitter thoughts and frustrating ones. He had managed through hard and persevering work to obtain a small herd of fine cows and with the help of his wife established a small dairy farm from which he shipped milk to Chicago daily. His children too were now a great help in the dairy. Each one was pressed into the service at an early age as soon as they were old to hold a shovel in their small hands. Manacha was a devoted father and took great pride in his children, but he was also an ambitious man with an ideal in mind. On the Sabbath after the noon meal he would reread the letters from his father. They told of great hardships of the backbreaking toil from dawn to dusk. But also of the “simcha’s”, the joyous occasions, in the community life. The best occasion was a wedding when all the folks from miles around would come bringing gifts of chickens and ducks, butter and eggs, and preserves of wild strawberries. Some would even bring a calf or a colt to start the young couple off on their own. There would be merrymaking for three days and nights. Another occasion would be for the birth of a child when there would be great rejoicing by these simple farm folk. Still another occasion would be the barn dances held during the summer months in the haylofts. The young folks would gather from miles around. Most of the older ones would come too. The musicians were the boys who could play the fiddle or harmonica. The square dances and the polkas were danced with great gusto and for the romantic ones the waltzes were quite the order of the day. Many a couple found romance at the barn loft floor dance. The pleasures were simple ones in those days. A visit to a neighbor once or twice a year when the work was lighter was common. This often happened in the fall of the year after the crops had been harvested and before the cold weather set in. Visits also occurred in midwinter on a bright sunny day when the air was crisp and cold. That was the time when the horses would be hitched to a sleigh and everyone bundled up to their chins and they would enjoy a ride to the nearest neighbor a mile or two away. The welcome mat was always out. Neighbors greeted each other warmly and were ushered into the house. Refreshments were quickly set upon the table — hot coffee or tea, bread and butter cookies for the children, and a pitcher of fresh milk or what ever happened to be in the pantry at the time. Life was simple for them and their pleasures were few and the work was hard. But they accepted the good with the bad. When a prairie fire broke out, as they often did during the hot dry weather, the neighbors all joined in to fight it. One young woman whose husband had gone to help fight the fires, being busy with her household chores, failed to see the fire surrounding her cabin, because the wind had shifted to a different direction. Looking out the open door she suddenly realized the danger and became terribly frightened and she started to run through the prairie to her nearest neighbor a mile or two away. But in her fright she became confused and ran in the wrong direction right into the midst of the fire. When the neighbors found her a couple of hours later, she was burned almost beyond recognition. Hers was the first grave in the newly formed cemetery which was set aside by the county. A plot or land of five acres in the midst of the prairie high on a hill was set aside for a Jewish cemetery. The tragedies, the hardships, the frustrations, and backbreaking toil far outweighed the pleasures in those days and little by little the settlers left their homesteads to go back to the cities and an easier way of life. Some who had obtained loans at the bank for supplies to build their cabins and food to carry them through the three years required by the government to live on the land before they could call it their own, just turned the land back to the bank and left. Others left after just a few months, some after one winter of extreme cold in which temperatures dropped to as much as 60 degrees below zero. And so, of the original 80 families, just a handful were left — five or six. And among them was Israel and his family. He was of a sturdier stock, a man of vision and determination. He dreamed of a land that would someday be called the “bread basket” of the world with acres and acres of fertile wheat fields. But before that dream could materialize, his life was brought violently to an abrupt end. The year was 1902. On the dairy farm that Manacha and his family lived everything was quiet and peaceful. It was just before dawn when there was a clattering of horses hoof’s, the dogs barked, then someone was knocking at the door. Manacha went to the door. Who could that be so early in the morning, surely not a neighbor to pass the time of day or a traveler or a peddler selling his wares. His hand trembled as he opened 1the door and peered out. The man descended from his buggy with a yellow envelope in his hand containing a telegram. Now that could only mean bad mews. No one was ever known to receive a telegram in those days that didn’t contain news of a tragedy or death in the family. Manacha slowly opened the envelope and, as he feared, it was bad news, very bad. His father Israel was dead, killed by a pair of runaway horses the day before. Manacha’s eyes filled with tears, his beloved father was dead at the age of 65. His dream of seeing his rather in this country was not to be. His heart was heavy and for several days he was bowed down with grief. But now he knew what he must do. It was up to him to carry on his father’s work and make that dream a reality. But unlike his fathers day, transportation was much faster for Manacha. He boarded a train in Chicago and in 24 hours he was in Edmore, North Dakota, about 800 miles distance. Edmore was a village about 12 miles away from his father’s farm. He hired a pair of horses and a buggy and in 21/2 hours he arrived at the farm. There are no words to describe the tears of joy that fell from his mother’s eyes at seeing her eldest son. Her heart was heavy with grief and her eyes dim with tears, but aa her arms embraced her son her spirits lightened. Her son would now take over the responsibility of running the farm. She knew that she could depend on her eldest sort. True, her younger son Max lived but twee miles away on a small farm of his own. He had married recently. But his marriage was not a happy one. His wife Blanche was born and raised in the city. The pioneer life was much too rugged for her. Her husband was an easy going, slow spoken and slow moving man. He had little ambition with not much energy left over for social activities after a hard day’s worm on the farm. Blanche craved excitement and missed the city life. Unfortunately their marriage was not blessed with children. It was a marriage that soon dissolved. Blanche went back to Minneapolis, her hometown. After a few years she remarried, raised a family, and lived a happy normal life. Max lived a lonely life. However, his good sense of honor and his easy going ways made him many friends and endeared him to his family even though they deplored his shiftless and useless life. To me he was a favorite uncle. He never failed to bring me a bag of candy. He was also a great story teller and I used to sit for hours entranced by his colorful and sometimes off color stories. He was a gentle person and he loved children. He used to come to our house and stay for several weeks at a time. He liked puttering around the farm. He actually did very little work himself. After a few weeks, my mother would lose patience with him and beg him to grumble about “freeloaders”. He would then know that it was time to move on. He died of pneumonia when I was 17 while on his way to visit his sister in California. By this time he had developed asthma and he felt that the warm climate in California would be beneficial to him. He was still driving a pair of horses, so he decided to travel as far west with the wagon as he could. So on a cool day in November he started out with his few belong­ings packed in his wagon. He was a pathetic sight and there was a lump in my throat as I waved good-bye to him. He was a man that was still pioneering in in era of modern science and great inventions. Henry Ford was turning out cars by the thousands, planes were already flying the skies, and phonographs, telephones, and electric lights had all been invented. Even radio was making its appearance in the form of sets with earphones. But he wanted no part of those fandangled inventions. He was embarked once more on a great adventure — his last. Alas, with the cold rains coming on, he developed a bad cold which turned into pneumonia. In a few weeks after he had departed, my father received a telegram that his brother was very ill. He immediately left by train, but he was too late. Max had passed away a few hours before. There was no golden rainbow waiting for him at the end of the trail. But perhaps there was. He was a simple man and lived a simple life, gave only of himself and expected very little in return. Perhaps he did find his rainbow at the end of the trail. Manacha’s sister, Sarah, lived but a few miles away from her parents house. She was a beautiful girl that loved life. She had a happy disposition and a spontaneous laugh that rang out high and clear. She married a man who was consumed with jealousy every time a man looked at her. With her laughing blue eyes and dimples that came and went, no man could pass her by without a second look even though she was innocently oblivious to it. Sarah’s husband made her life miserable. Being young she loved to dance and was always surrounded by young people. But her husband would have none of it after they were married. Being deprived of all this, life became very dull and monotonous for her. True there was plenty of work to keep her busy. A farmer works from sunup to sundown and a farmer’s wife works just as hard and long, or longer. Their marriage was not blessed with children to make the bond stronger between them so after three years they were divorced. In those days divorce was looked upon as somewhat of a disgrace to the family. Sarah’s mother and father were very unhappy with their two younger children. Manacha on the other hand was their pride and joy. After the proper mourning period was over, Manacha went back to Illinois to his home. He persuaded his wife to move to North Dakota, much against her better judgement. She wanted to stay close to a large city where her children could have the advantages of good schools and her eldest daughter, Molly, who was already working in Chicago at the Boston Store. She was a beautiful girl at sixteen and her mother wanted her to stay in the city where she would meet young folks of her age. I had not yet put in an appearance. But my father could not pass up the chance of owning his own land, and, besides, he felt that his mother was alone now and it was up to him	to see that she was taken care of. It was finally decided that they would sell their dairy farm and move to North Dakota. My father and my eldest brother, Louis, would leave first. Not the way his father did 11 years before by covered wagon, but by train. My mother was to follow later after the baby was borne with my two younger brothers, Mayer and Joseph, who were ten and eight years old, respectively. before me. I was a “change of life” baby. It was a great inconvenience to say the least. She was not looking forward to raising a child at this time of life in a pioneer country without any of the modern facilities of those days. other conductor that took his place. All told it was a three day trip by train. conductor came through again, she had Mayer inquire how much farther we had to go. He was quite perturbed when Mayer mentioned Edmore. He said he knew nothing or the note and that the train did not stop in Edmore. He would let us off at a station before a small village called Lakota. It had just a store and several houses. As luck would have it, the train arrived at 9 o’clock at night. The conductor helped my mother and the children down and deposited her with her baggage on a deserted depot platform. Luckily, the station was open during train hours. My mother was worn out from the long trip with the infant in her arms. She sat down on the bench while the boys went in to ask where we could get accommodations for the night. Just then the station master shut the ticket window down. They didn’t know which way to turn. However, after about a half hour he came around the platform and saw my mother and the children still sitting there. The boys asked him about finding a room for the night. They explained that their mother could not speak English very well. It finally turned out that the man could speak German, and, since my mother spoke it fluently, the problem was soon solved. The station master first sent a telegram to the Edmore station explaining what happened and asked that a message be given to my father that said that we would be there the following night, since there was only one train a day. He then took us to a house that had an extra room and the good people gave us lodging for the night. They were very kind and felt sorry for my mother. The next day they fed us dairy food, since my mother would not eat meat. She kept a strictly kosher house. The next evening they escorted us to the train. The station master saw to it that we got on the train and he gave the conductor instructions to let us off at Edmore. My mother never forgot the incident nor the kind people. laden with a crock of fresh butter and one-half gallon of sweet cream. Now she	could speak sane English and she thanked them properly. They were interested to see the little girl of seven, who was the infant in arms. They were the first friends my mother made in North Dakota. us at the train. Edmore was a two and a half to three hour drive from our farm. The roads were little more than trails through the fields. Since it was early spring the fields were just being cultivated and	readied for seeding. very affectionate woman, she showered me with love. However, she was also a very sensitive person who was hurt very easily and not one to forgive quickly. My mother knew this and she wanted my aunt to adopt me legally so she could not turn me out if I should displease her. This my aunt refused to do saying that if my mother did not trust her enough to raise me, adopting me would only make matters worse. So after many arguments, my father and my eldest brother Louis, came to take me home. They were very much against the whole thing and I being just a baby of a year old had no voice in the matter at all. I was happy to be back home with my family. Although years later when I was growing up, I often wondered if my life would have turned out differently had my aunt raised me. She would have been able to give me all the advantages that my parents could not. Perhaps there is a pattern in life that we are destined to follow against our own will. When I was, four years old, my sister Molly, who was 20, came to visit us. She had not seen her family, her parents, brothers, and baby sister for four years. She longed so to see them that my parents sent her a return ticket to Chicago to share the fare. It was a great occasion when she arrived. I remember the day well. A great deal of excitement prevailed around our house. We had just moved into our new house, which my father had helped to build. It	was a palace compared to our old adobe and frame house. It had two large rooms downstairs with a summer kitchen, which as the name implies was used only in the summer, because it was an unfinished room. Our cream separator was installed there. The cupboards were used to store odds and ends, such as horse medicine, farm equipment, old clothes, crocks of cream, cases of eggs, some harnesses, as well as, a kerosene stove for light cooking when it was too hot to use the coal stove. In fact, it	was a combination workshop, storage area, and extra kitchen. In the winter we stored various foods there, such as meat and poultry, which were first frozen solid by laying pieces on boards until completely frozen and then put into crooks., covered and stored. It would stay frozen and fresh for weeks, a sort of deep freeze, a method the farmers had devised long before refrigerators were invented. Upstairs we had two small bedrooms and a large one, which was open and through which you had to pass in order to get to the small bedrooms. It was sort of a hall bedroom. Bathrooms were unheard of on the farms in those days. There was a small building called an outhouse about 25 feet from the house that served this basic need. It was seldom used, however, by the men, because the barn was so much more convenient and it was warmer in winter. My sister arrived on a beautiful June day and of course the whole family turned out to greet her. She was a beautiful girl with chestnut colored hair, which framed her round face in soft curls, a fair complexion with lovely blue eyes, and a petite figure. She was soft spoken with a sweet smile. She had a quick temper but indomitable spirit that was to sustain her through years of hardship and sickness, grief and poverty. A spirit that enabled her to look beyond her own misfortune and to give a helping hand to others she considered less fortunate. I remember the day well. Two things happened that stand out in my memory. I was only four years old and, of course, I wanted to show off for my big sister. We had a stone cellar with a trap door. My mother went down the cellar to bring up some butter that she had stored in	crocks. After she came up and before she had a chance to close the trap door, I decided to jump across a span of about four or five feet. One minute I was standing on one edge and the next I disappeared. My family heard a thud and rushed to where I had been standing. They all held their breath fearing the worst. My oldest brother reached me first just as I was beginning to stand up from my hands and knees. I had landed squarely on my feet, but lost my balance later from the shock. I was none the worst for my little show off feat, except for bruised, hands and knees…or course, I was soundly scolded for putting on such a performance. Even a child of four was not pampered in those days. Thee second incident I remember was washing my sister’s blouse, a very beautiful silk blouse, 1n our “slop” pail, which always stood next to the wash. basin. Of course, I only meant to be helpful. For this I was rewarded with a good spanking and sent to bed without my dinner. However, my sister took pity upon me and brought me something to eat. My parents had sent my sister a return ticket, but to their great disappointment the return ticket was never used by her. She met a young farm boy and fell head over heels 1n love. He swept her off her feet. He was tall, dark, and handsome. The prince she had dreamed about all her life. A charming and clever young man of a Jewish pioneer family nearby. Despite the opposition from both sides, they intended to marry. His family believed her to be a little city girl, frail and shy, certainly not fitted to the hard life of a farmer. My mother was against her beautiful daughter marrying a farm boy and having to endure the hardship of the pioneer farm life, knowing all too well what that would entail. However, regardless of the opposition, love won out. A few months later she was married in our home. I remember the excitement that prevailed for days preceding the wedding. It was a typical farm wedding, except that the ceremony was done according to the customs of the Jewish people. I remember the canopy, the breaking of the glass, friends and relatives congratulating the young couple and wishing them well. I remember my father dancing a “cozatchka”, a European dance, with me in his arms. Right after the wedding my sister and her husband took me to their home, which was only one and a half miles from our place. For the next 10 years, I was shifted back and forth from my sister’s house and back to my parents. The happiest days of my life were those I spent with my sister. I came to regard her as both mother and sister and I adored her. stern nature and beset with a great many problems of his own he had no time or patience with a little girl who, would blush a bright red and only stammer “yes” or “no” when he spoke to her. My sister’s life was a very tragic one. She became sick after her first born and became even more frail than she was. After one and a half years of living on the farm they gave up the rigors of farm life and moved into town 25 miles away. Joe tried many jobs, but not being trained in any particular trade or profession, they had their financial problems. He finally got a job of water carrier, hauling drinking water, since the city water was from an artesian well that could not be used for drinking purposes because it was extremely salty. For two years he delivered heavy buckets of water upstairs and down at the crack of dawn in summer and in the extremely cold winter mornings when the water would freeze before he could deliver it. But he was strong and healthy and hard working being used to farm work. However, after two years of this, he became ill with the “grip”, as it was called at that time, a very bad cold. But the family must eat, so he dragged himself out of bed to deliver the cold icy water. He developed an infection of the kidney from which he never seemed to recover. He finally gave up this job and moved to another town, Starkweather. But before he could find an easier job, he underwent surgery for the removal on one kidney. The doctor advised him to take it easy for several months (which he could ill afford) and then he must never work hard the rest of his life. Then began a struggle for survival. Molly went home to her parents and Joe to his. By that time they had their third child, a 11ttle girl who only lived six weeks. I can remember my sister sitting up in bed and weeping bitterly over the loss of her child and the cruel fate that was to pursue her for many years to come. When her husband became strong enough, he came for her and they started life anew in the small town of Stark­weather. For several years life flowed along fairly smooth, except for the illness that plagued my sister between child bearing. She bore six children and with every child she became more frail. Her husband barely made a living. His health, too, became progressively worse. After her sixth child was born, the doctor advised her not to have anymore, as her life would be in danger. This in itself was a blow to her as she loved children, but she had no time to worry about that. What did worry her was her husband’s health. I stayed with them and went to school in Starkweather for several years. I can remember helping my sister with the house­ work after school and on the weekends. During my last year with them I even calcimined the whole house. I loved beautiful things and colorful surroundings. I can remember selling bottles of furniture polish for 25 cents and with each bottle I gave away a picture, a beautiful print of scenery, floral or religious type. The customer could take his choice. I sold 24 bottles and as a premium my sister received a whole set of dishes. I was quite proud of myself that I could give my sister something that I had worked for to show my gratitude for all the solicitous care she had given me throughout the years. How I had the nerve to go house to house selling something, I will never know since I could hardly say more than two words to strangers without blushing. I had quite and inferiority complex. the fact that I was the only Jewish girl in my grade and for that matter in the whole school didn’t help any. I realized quite early in life what it meant to be a minority group of one. walk to the picnic. I said I could, but that I wouldn’t be allowed to walk alone. To my great embarrassment she explained my problem to the class and asked “Who would like to walk with Rose?” It was complete silence for a few seconds and I finally got enough courage to raise my eyes and to my great astonishment, nearly everyone in the class had their hand up. We ended up with the whole class hiking to and from the picnic and that was great fun. Not a worry or care in the world! Unfortunately, life does not remain that way. Shortly afterwards, World War I began. Then came the great influenza of 1918 that took such a toll on many thousands of lives in this country. There wore no antibiotics in those days to combat disease. Tragedy struck nearly every family. My mother and my oldest brother died within one week of each other. My brother was married and had a son of one year old. They lived within two miles of us. My mother died without ever knowing that her beloved son Louis had died two days before. Our whole family was struck down almost at the same time. Help was almost impossible to get since every family had the same problem. Country doctors were so overworked and made their daily calls from towns as much as 20 miles away. On their way they would try to get help from one neighbor to the other, since food would have to be brought from town and livestock would have to be attended to, and the cows would have to be fed and milked. As each member of the family recovered, they were sent to help their neighbors a mile or two away. Our nearest telephone was four miles away, so communication was almost nil. Our	family doctor who lived in Starkweather 18 miles away kept us informed of all that was happening when he stopped in. I was only 15 years old then, but I can recall the sad events of that winter as if it was yesterday. My father and my two brothers recovered from the illness. But our family life was not the same. With my mother gone the house seemed empty and lonely even though my sister-in-law, my brother’s wife, and her child came to live with us. There was a void that could not be filled. My sister now lived in Devils Lake, a town about 25 miles away. Her husband had passed away a year before, leaving her destitute with five small children. She managed to survive with a small Mother’s pension. She worked hard and managed to keep her family together. The next summer my father sold the farm. My two brothers left for the west coast to try their fortunes there. My father was now a lonely man with his family gone. The land he loved was no longer his. His dream of a lifetime was shattered. The Baron de Hirsch Colony had dispersed. He was the last of the Jewish pioneers to leave that area. But now, his father was buried in that cemetery only six miles away as were many of the brave Jewish pioneers of the Baron de Hirsch Colony and someday he too would be buried there, next to his beloved father. Many years have passed. It is now 1965. I stood at the gate of the cemetery with tear dimmed eyes. The prairie grass was high in the month of June, but I could still see the names on the tomb­stones: Canter, Hoffinan, and, yes, side by side, Israel Mill and Manacha Mill tombstones carved out of stone that would stand forever as monunents to the achievements of those brave Jewish pioneers.